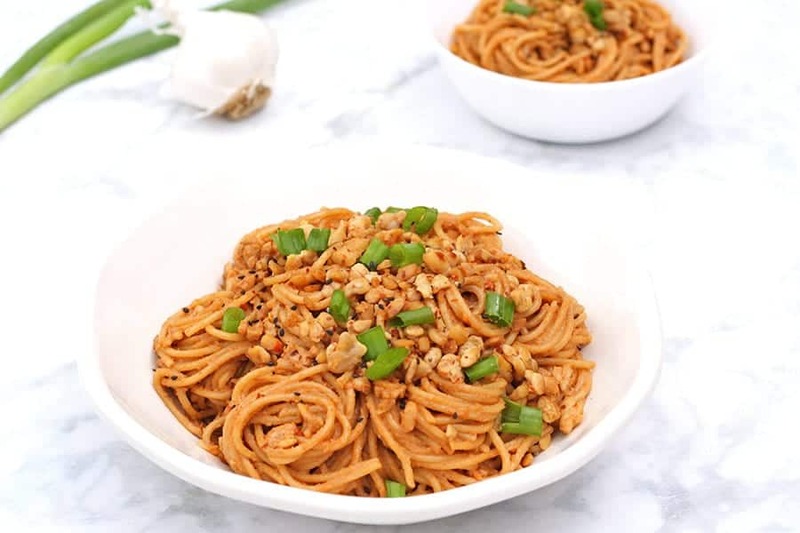 These Spicy Sesame Noodles are perfect when you have a craving for Chinese sesame noodles but also want a little kick. 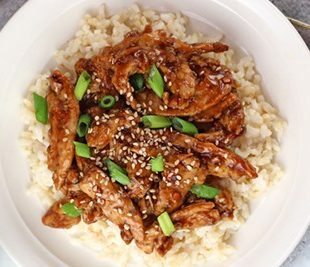 They’re so easy to make and much healthier than takeout! Pasta is a staple in my house. Truth time: I probably have about 10 different kinds of pasta in my kitchen right now. It is so comforting to me because it’s what I ate all the time as a kid. Even now I have to make a pasta at least once a week. Some of my favorites are my Vegan Mac & Cheese and Thai Basil Noodles. My easy One Pot Lemon Pasta is perfect when I’m in a hurry. Knowing how pasta obsessed I am, you probably won’t be surprised when I tell you I love the cold sesame noodles you can order at Chinese restaurants. I just can’t get enough of them. There’s just something about the creaminess of the sauce that gets me every time. To save some money (I used to order the sesame noodles often), I thought I’d start making my own version. Since I’m also obsessed with spice and hot sauce, I decided to put my own caliente spin on the noodles. My version, which I call Spicy Sesame Noodles, adds a little heat in both temperature and spiciness. To add some protein, I decided to include tempeh. The method I describe in the recipe below is my favorite simple way to cook tempeh. All you need is some tempeh, olive oil and 5 minutes. The tempeh comes out browned and tasty! 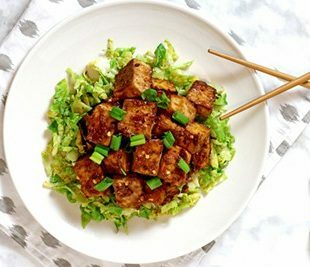 If you’re new to tempeh, check out my Teriyaki Tempeh recipe where I share more info on this interesting food. 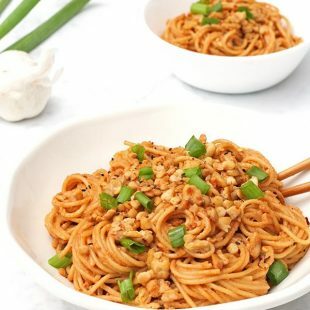 These Spicy Sesame Noodles are perfect when you have a craving for Chinese sesame noodles but also want a little kick. They're so easy to make and much healthier than take out! Cook noodles to package directions. While noodles are cooking, put tempeh block in a bowl and kind of mash it with a fork until crumbly. Add oil to large pan. Once heated, add tempeh crumbles and tamari and cook for about 5 minutes until heated and browned. Add all sauce ingredients to a bowl and stir until smooth. When noodles are cooked, add them to a large bowl with the sauce. Add in tempeh and mix. * Nutritional info does not include pasta. 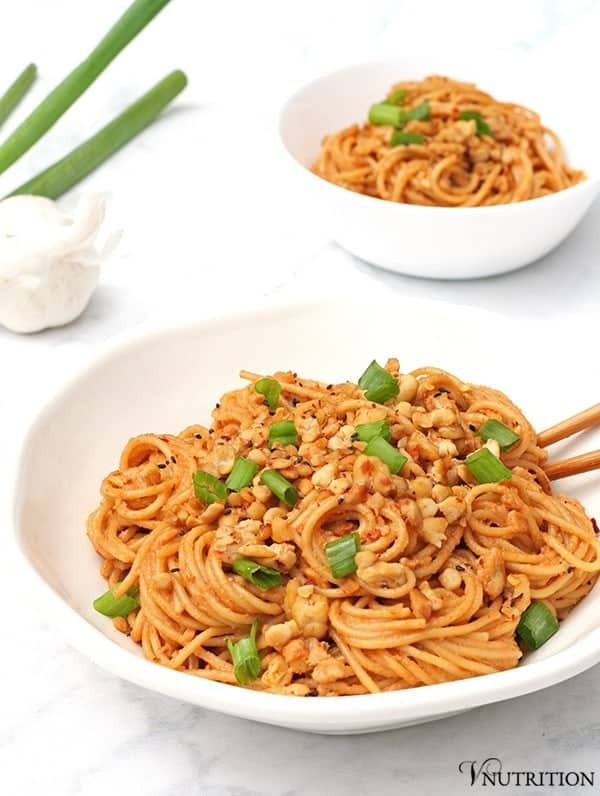 Like my Spicy Sesame Noodles recipe? It would be so wonderful if you could give it some love by sharing it! Thanks so much Deborah! Loving the noodle posts! These nooodlessss look so good!!!!! Can’t wait to try them. Thank so much Julie! Let me know what you think when you try them! Well deserved Mary Ellen! These noodles look delicious. It might even convince me to try tempeh again… My past experiences with it have been very disappointing! Honestly, I don’t like blocks of tempeh much. I’ve had some versions that were okay at restaurants but when I try to make it before using this technique, I didn’t much like it either. If you do try it, let me know what you think. I’d love to hear. Oh man, these noodles look great, Mary Ellen! I’m avoiding soy a bit these days, but I think tempeh is a little easier on my system. Do you have any thoughts on what I could substitute (if anything)? The tempeh is broken up and kind of reminds me of crumbled sausage. A non-soy vegan sausage would work I think. 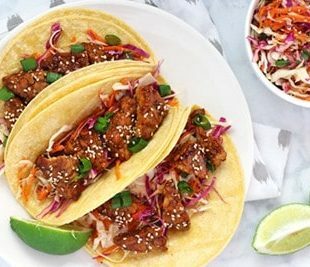 I found this page: http://www.peta.org/living/food/guide-soy-gluten-free-meatless-meat/ and the non-soy and non-gluten option of Neat might work if you crumble that up. Beans like lentils might work as well if you kind of crisp them up a bit. Let me know if you try something else and how it goes. I can put it as an addition to the recipe. 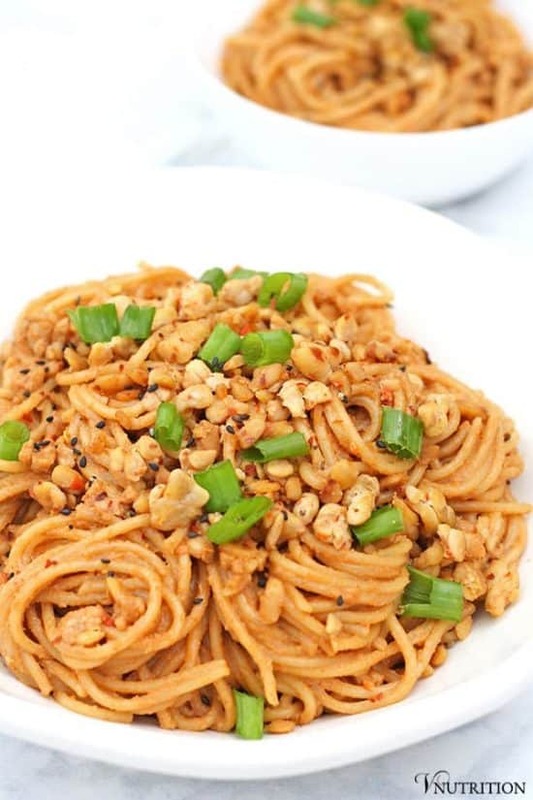 This noodle dish looks and sounds amazing, anything with spicy peanut flavors. Yum and thanks! Thanks so much Christine! I’m all about spicy peanut flavors too! I thought it might have peanuts in it from the picture, but I was happy to go to the actual recipe and find out it doesn’t (we have allergies in my family). I can’t wait to try the recipe – believe it or not, I haven’t actually used tempeh yet, so this seems like a good place to start! Oh good! I almost put peanuts in it and I’m glad i didn’t! I hope you like it! Tempeh can be tough sometimes to get it just right but i find this cooking technique is so simple and tasty. I love Thai-style dishes especially with the little crunchy peanut pieces. I can’t wait to give this a try! Thanks so much Meagan! Those little bits are actually tempeh but peanuts would be really tasty as well! You can sub peanuts if you have any problems with soy. Nom nom I wonder if I could do this with plainole spaghetti as I am not a huge fan of noodles. Shaheen, I’m sure you could use any type of pasta you’d like! I actually used spaghetti in the recipe! 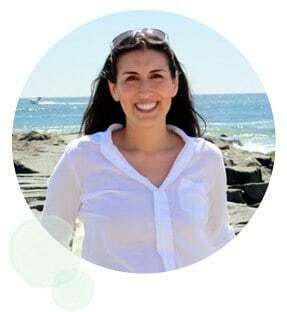 I think you did comment on the guest post! I remember you saying something about the spice. It should be fine with a little less spice (though I love anything spicy). ? I’m so glad that you enjoyed it Shari! Thanks so much for coming back and letting me know. Peanut butter is a great substitution for the almond butter. I’ve actually done that myself as well when I ran out of almond butter. I appreciate the view and you letting me know that you liked the recipe!